What do you make for dinner when it's 6pm and still close to 90 degrees? We don't have a/c in our apartment, so on nights like this, turning on the oven or the stove is simply NOT an option. So I made tuna. And a salad. Let's talk a little bit about tuna. I know some people have aversions to it, which is okay, you're allowed. But as someone who hails from nordic ancestors, I have a thing for fish. And my mum made a mean tuna salad when we were kids. And maybe that's the key. Someone has to make it for you the RIGHT way, and then you're able to appreciate it. I don't know that mum always made it the same way, but the night of the '89 earthquake she made us tuna sandwiches for dinner (no electricity) and she used red onion and for some reason I latched on to the "Earthquake Tuna" and that's how I've made it ever since. Drain the tuna and place in a small bowl, break up with a fork if needed. Mix in the rest of the ingredients and you're done! Oh! And the salad. 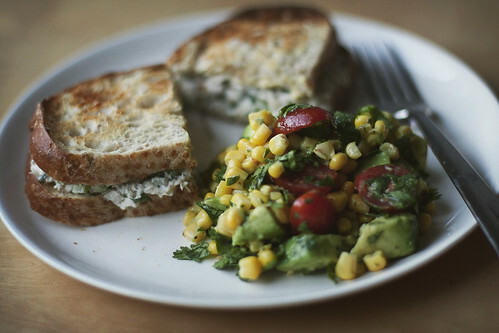 It's a simple corn, avocado and tomato salad. I used to make it so much that I didn't even look up the recipe. Rather than type it all up here, I'll just point you to the link. It's a Paula Deen recipe and it doesn't use a stick of butter! It's even one that you can make the night before (good for lunches and potlucks!) because the lime juice keeps the avocado from turning brown. I leave out the red onion most of the time, and I've even made it without the cilantro and it's still good. So that's how I try to survive dinner during a heat wave. It also helps, after you're done all the slicing and dicing for your meal, to go put your feet in the pool and cool off for a few minutes before you devour your oven and stove free dinner.